The Finnish education system as it is today first appeared through reform efforts in the 1960s. In the 1950s, Finnish society changed from being a primarily agricultural based economy to more of an industrialized economy. Finland also experienced a baby boom. In order to address the growing educational needs of the country, a new plan of comprehensive schooling was formed that was centered around the ideal of free education as a basic right for all citizens. Key questions of reform focused on the vision, implementation, education and guidance and the documents that needed to be created to communicate and support the new system. There was also a change in the teacher training programs to meet the growing needs of schools. As a result of these developments, a system with no dead ends and continual educational opportunities developed. Formal schooling begins at age 7 and ends with the completion of basic education at age 16. From that point, students are free to make educational decisions based on interest and desire. Although, education is not mandated after age 16, 91% (Statistics Finland: Education) continue on to upper secondary school. 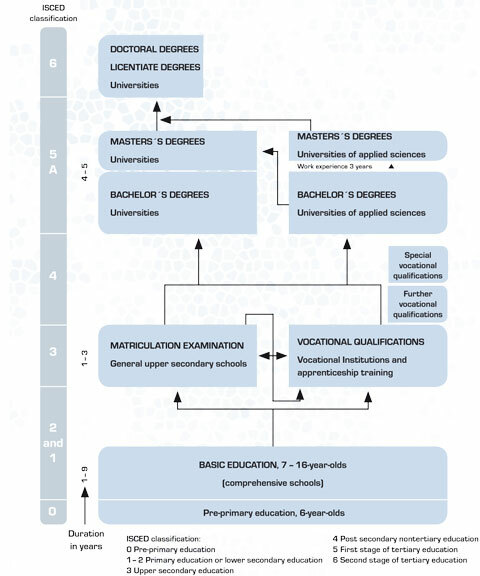 The chart below outlines the structure of the Finnish educational system. Although there have been continued reforms since the 1960s, Finland has stayed true to the long-term vision of equal education for all citizens. Fellow Fulbrighter, Christine McCartney captures this historical trajectory in comparison with the US constantly changing reforms in the video below. Please checkout her website for more information.